Sheckley was an ideas man. His stories are solid concept, expertly plotted. And even when the core of a story is exceptionally dark and filled with terrifying moral lessons, it is still somehow written with humor. 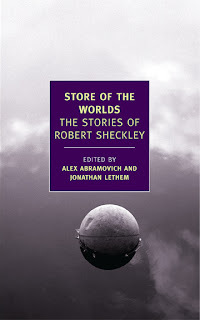 Last week, I linked to a fantastic review on Strange Horizons that states, "The heart of a Sheckley story is how it ends." And it's true. There's a whole lot of comeuppance in store for the human race in his future vision, a race to our very own end. The best that the best of us can hope for is to be able to get away from everybody else. That conclusion is what helps the stories feel timeless and what causes them to stay with you. Read those six then read them all. Highly recommended. Also? Read the introduction.